Bubbles got a new toy and so did I. Orcella, Orsus, Montsant, Spain, 2001 for $11.99 at Colorado Wine Company in Eagle Rock. I can't believe the price! The wine is, appropriately, a little animally, like wet dog, but in that good Old World way. Give your pooch a bath and let her roll all over your micro-suede sofa or pop open a bottle of Orcella and you'll get the full smelly experience. BUT REALLY, it's got great sweet strawberry fruit and moderate acidity, not too jarring and very light tannins. Mostly it's cheap, and that's just the kind of wine I like to drink when Bubbles and I are going to bed early and can only have one measly pathetic glass. Another recommendation by cheese genius, Sebastian Robin Craig at The Cheese Store of Beverly Hills. Durin, Pigato (the grape), Riviera Ligure di Ponente (the region), 2006, $20.00. Sebastian warned me that this one would take a bit to time open up, and he was right. I decanted this wine and put it in the fridge for 2 hours. It really did open up nicely. The acid, though still tame, revealed itself, but mostly there was just lots of that classic juicy pear quality that I find in so many Italian white wines. Drink up! "Very crisp, clean, citrusy and smooth. It waves at you from the back of your tongue." I think that means its finish is persistent - anything that waves at me from the back of my tongue is a welcome addition to my repertoire. You can get a cold bottle and drink it with a fabulous sandwich right there in the store. Ask for Francine, the owner, she will hook you up! My tip for the day: When your only choice for wine is Rosemont Shiraz or Chilean Cabernet, order a cocktail. Last night our realtor, Claudia, took us out to listen to Cuban Music. She's from Guatemala and wanted to give us an authentic Latin experience. We went to La Floridita, on the SW corner of Vine and Fountain. It's in a strip mall, and it's great! We had a fairly respectable dinner for a salsa club. I had beans, rice, plantains and some unidentifiable egg thing. Anyway, when we arrived Claudia said, "You pick the wine". Now, I hate to be a snot, but the list was bad, and it's not their fault really, it's just that they are known for their Mojitos - grandpas secret recipe - not for wine. Now I'm not bashing Rosemont or Chilean Cabernet (well, actually, I would never drink either of those wines) for any other reason than if I can get it for $6.99 at Trader Joe's why would I buy it for $9 a glass La Floridita. The mojitas really put peter in the mood to dance. And in the three years I've known him he's NEVER danced! So ladies, drag your guys there and guilt them into the most embarrassing three minutes of their life. There's more to life than wine - there's dancing. I heard this on NPR this week and I get it. Aromas are important. About 90% of what you taste is actually what you are smelling. So I'm on the bandwagon. How much do think this honker is worth? I actually want to ensure my whole body. Just in case. My comment here is yeah, well, what if a secretary loses her left pinky and can't type anymore or what if I get carpal tunnel AGAIN from opening up too many bottles and can't b a sommelier anymore? The world is a dangerous place ANYTHING could happen at ANY time. What makes this guy different from anyone else? The cheapie comes home to mama. I wrote about the more expensive of these wines a couple weeks ago. And now, the cheapie! At $18.99 Dm. du Colombier, Crozes-Hermitage, 2005 is so good I'm serving it at my wedding. And that's all I'm going to say, because gosh darn it, that should enough. This photo on the other hand makes me dizzy because it's backwards. I missed my post yesterday due to Easter Sunday... so today I have 2! We bottled Hocus Pocus Pinot Noir on Friday and last night wanted to try it out against another Willamette Valley, Oregon, Pinot Noir. 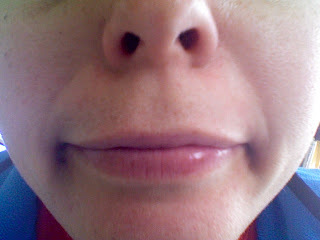 This one is called Cristom, 2005 vintage. It's interesting because 1) we bought it in half bottle (for $18.99 at the Wine House) 2) it's domestic and we rarely drink domestic (it's on the list of New Year's Resolutions) 3) it's sooo different from Hocus Pocus Pinot, which is very light and "primary". This wine is a little oaky, lots of sweet vanilla and stewed cherry fruit. Nothing green about it. So many Oregon Pinots can taste a little too cool climate vegetal to me. The alcohol is a little hot, but not so much so that it totally threw me off. Perfect for the new episode of Rock of Love 2. PLUS, my very good friend, Cara Bertone, says it's perfect with Easter chocolate. We tasted it last night and then had the last drops at lunch today. It's not LSD, but it's close. Domaine Laure, Saint Aubin, Les Eduens, 2005. ($22.99 at Wine Exchange) If you love acid - and I love acid - you will love this little Red Burgundy. It's very rare to see St. Aubin Rouge in the States. The appellation is located at the top of hill, kinda wedged between the upper parts of Puligny-Montrachet and Chassagne-Montrachet. The appellation produces mostly white wines, so this red drinks like a white, loads of taut acidity, stony minerality and subdued cherry fruit. This wine NEEDS food or at least cheese or it may be a bit of a shock on your palate! My dog, Bubbles, wanted to recommend this wine, but she's not old enough to drink, so we had to hide her face. Don't need LAPD showing up at my house. Avignonesi is a Tuscan producer known for their pure expression of Vino Nobile di Montepulciano (not to be confused with Montepulciano d'Abruzzo in the South or Brunello di Montalcino also in Tuscany) This wine is 85% Sangiovese (well actually the Sangiovese clone Prugnolo Gentile), 10% Canaiolo Nero and 5% Mammolino. Whatever, right? It tastes good. Many Vino Nobile's are less than noble, usually rustic and edgy. However, the Avignonesi has firm tannins, light cherry fruit and good acidity. A nice everyday drinking wine for $22.99 at the Wine House. They also have it in half bottles at Wine Pavilion in Orange County for $12.99. Morderee. Buy early for Thanksgiving. Dm. de la Mordoree, Cotes-du-Rhone, 2006 at $11.99 (Grenache based) is juicy fruit fun and totally crazy. Crazy like that guy on the radio who yells about discounted mattresses. You can actually get this wine just about anywhere, though this happened to be one of the bottles I grabbed on my Wine Exchange spree in Orange last week (see the Magnien post below). This is generally my favorite Thanksgiving wine because our parents don't care what they are drinking and so we don't want to waste any money on them. Even though it's not Thanksgiving you may have noticed it's been unseasonable cold in LA the last few days (only in the high 60s for goddsake.) I grabbed a faux fireplace and this CDR and curled up with my new dog (who, incidentally, doesn't care for Morderee - but there's no accounting for taste.) We drank this with stuffed cabbage left overs. A cheap cheap night in!!! As a side note you should never go out in public after eating cabbage. P.S. For a few more bucks they make an even better wine from LIRAC. Ask for Kyle at Wine Exchange and he'll point you in the right direction. I like to decant wine because I think most all wines do better with some air. This one left a surprise at the bottom of the decanter - loads of tartrates. Tartrates are perfectly harmless and completely tasteless, but when they get caught in your mouth the crystalized texture is fairly unpleasant. Now for the really boring part... As if that wasn't enough.... There are two primary acids in grapes, malic (found in apples) and tartaric (found in, well, grapes). As grapes mature on the vine, they lose malic and gain tartaric acid. These tartrates are present in wine as potassium tartrate or cream of tartar - that stuff that no one quite knows what to so with in their spice cabinet. 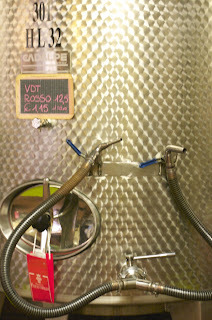 Potassium tartrates are partly present as salts that if not properly stabilized during production will precipitate out in wine over time and especially at lower temperatures. Have you ever put a perfectly clear and clean bottle of white in the fridge only to pull it out a week or so later and see that there's now "stuff in the bottle?" 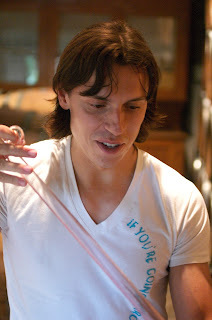 Just do a little decanting... and then you can be like me and post the most boring blog entry ever produced. I haven't given a restaurant recommendation yet, mostly because Peter and I have been cooking so much at home. Socially, we're very lame. My first restaurant post is naturally from aoc on 3rd Street. Novaia, Valpolicella, 2003 from Italy. I think about this as a "country wine". It's rustic, slightly chocolately with classic Italian dusty cherry fruit. It's a steal at $44 on the wine list. I gave this to my long time Tuesday night friends, Russ and his daughter Lindsey, and they seemed to really enjoy it! Trying to find that perfect everyday occasion or "Tuesday Night wine" isn't as easy as it sounds! Pictured above is your friendly aoc bartender Rick Margaritov. Ask for him by name or just identify him by his mugshot. This is Peter's pick. He loves this Charles Joguet, Chinon, Les Varennes du Grand Clos, 2005 from the Loire Valley in France. It's 100% Cabernet Franc, a grape that can be weedy and vegetal when done wrong, but when done right it's pretty magical. There's nothing else quite like it! Peter says, "It's young and powerful... stylistically it's concentrated with black fruit, acid and tannin, all in balance." So pick up a bottle for $29.99 at the Wine House. AND I need to know - do you think that's a lot of money to spend on a bottle of wine? Give me your feedback! Frederic Magnien has long been one of my go to Burgundies. Last night we drank the 2005 Bourgogne Rouge ($16.99 at Wine Exchange in Orange) with Chinese Food. It's light and lean but has a sweetness on the palate that's frequently found in the 2005s - a classic vintage in almost all regions of France. You'll noticed it's also labeled as Pinot Noir. This is a new trend for the American market and the Sideways generation who have grown to love Pinot, but might not know that Pinot Noir and Red Burgundy (aka Bourgogne) are synonymous. It seems like a trek to make the drive to Wine Exchange, but they really do have some of the best prices in town and a huge selection of Burgundy and, well, EVERYTHING. Make a trip, put together a few cases and you're set for the month! Also, check wine-searcher.com for other stores more local where this wine is carried. If you can afford the more expensive Magnien wines, buy them now because the 2005 is a vintage to hold onto. Look who's coming to dinner... as soon as you buy the right stemware. Good glasses are vital to enjoying wine. Which is why I am baffled by these new designs. Another day another gimmick. They look truly difficult to drink out of and, in the case of Swing, unpleasant to hold on to! Stemless glassware is all the rage and for some occasions are fine, but nothing makes me more enraged than when I go to a restaurant, order a nice bottle of wine and get a stemless glass or a clunky Libbey glass. The proper glass will expand the aromas in the wine. I think Crate and Barrel makes one of the best everyday drinking wine glasses. As for the big guns, there is really no comparison to Riedel. Here's a short list of awful wine glasses that are widely available and undoubtedly end up on many gift registries. Macy's truly has the worst line-up of stemware I've ever seen (though they do sell Riedel). Euw! Chunky and heavy, short and stubby. If you can't swirl it, avoid it. Colored and / or mirrored glasses should never ever be used. A wine's color is integral it's enjoyment. And any reference to Harvest or Tuscany should be avoided at all costs. These are glasses for wine tourists. If you drink wine every night you must invest in stemware. See above. My cabinets packed with glasses. It's well worth the investment. Ask for them for your birthday, for Christmas for your wedding registry and it won't be long before you build up an arsenal. Then you can invite me over for dinner. Don't Poo Poo My Piron. Cru Beaujolais (meaning from one of the 10 villages in Beaujolais - NOT that crazy Nouveau stuff) is one of the pleasures of everyday life. In this case, Brouilly is the name of the village. The Piron is lush, full of sweet red raspberry fruit balanced with lots of acidity. It's light and easy to drink and this is the new favorite around our house. And, my grocery store shopping friends, I bought it at Whole Foods for $18.99. I am putting it in big bold letters so that you know not to pass this one up, it's a delicious treat! And get some of those pitted, herbed and cured black olives at the olive bar... double delish! You don't even need a glass with a stem for this one. I get a BIG kick out of "no corkage." It's the little things in life that really make it worth while, you know? We had dinner at Cube on Melrose tonight, my fav no corkage local neighborhood joint. Home of Divine Pasta Company. (Click here for some reviews)Bring your own wine and get out of there for $60 for 2 people. That means you can splurge on the wine you bring in. Do not wimp out and bring a $20 bottle! Peter and I brought a great small production Italian wine, Testamatta (literally "Crazyhead" in Italian.). Our friend Giacomo Sesni (pictured above at the winery) makes this wine for revolutionary producer Bibi Graetz, in Fiesole, right outside the city limits of Florence. 100% Sangiovese from the 2005 vintage, you can get this wine at the Wine House and K & L. At around $50 a pop, it may sound expensive, but think about this: what wine can you get for $50 at a restaurant? This wine would be $150 on list! So bring your own $50 wine and still get of there for a Benjamin. It's a Shame. Or I'm a Sham. I am ashamed of myself. Peter bought this bottle of dry Portugese wine at the Wine House a week ago, and I have been DREADING it's contents. I am not one to venture into unknown territories to buy cheap wine. But here I am drinking this lovely bottle of Cardeal, Reserva, Touriga National, Dao, 2002. It's just packed with soft, pretty red fruit, has really attractive Old World dusty quality but it's totally clean and has great acidity. No heavy tannins and nothing that tastes "cheap" about it. Lip smacking good! Cardeal is a MUST BUY for $11.99. Show up at a party with this sweet baby and everyone will think you are adventurous and wine savvy. I love that vintage stamp is reminiscent of a Port bottle. Touriga Nacional is the grape variety (AKA Tempranillo - the grape used in so many lovely Spanish wines - like Rioja and Ribera del Duero.) Dao is the region. Reserva means very little (unlike in Spain and Italy where it generally refers to the time spent in barrel.) Check out this great site on interpreting Portuguese wine labels. Truly separated at birth, Sebastian from the Cheese Store of Beverly Hills is my long lost soul mate. He recommends this wonderful little 2005 Anjou from biodynamic producer Domaine Philippe Delesvaux. It's dark and juicy, filled with candied kirsch fruit and a solid backbone of tannin and acidity. The PERFECT cheese wine. This wine needs cheese like I need a pilates class to firm up these cheese loving thighs. Sebastian is a cheese genius (that's the official term) and he will guide you to the perfect cheese. A steal for $22.00. 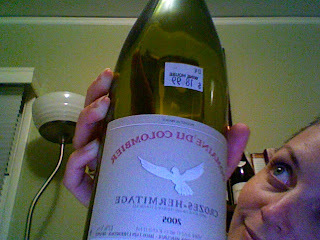 Domaine du Colombier, Crozes-Hermitage, Cuvee Gaby, 2005 is a terrific wine that peter and I have been drinking a lot of. It's $24.99 at the Wine House. They make a less fancy version (not called Cuvee Gaby) for $19.99 that's equally as good. It's 100% Syrah from the Northern Rhone Valley in France. It has everything you want in Syrah, meat, smoke, game, dark plummy fruit and firm acidity. Delicious and brooding. Run to get this now, because I know Jim gets it in limited quantities! My new favorite sandwich shop! Froma on Melrose. I had a tasting there this weekend with Veritas Imports. Four wines were paired with 4 different bites to eat. The standout was Domaine Stirn, Riesling, Alsace, France, 2006 ($24.99) with a Bosc Pear, Gorgonzola and walnut crostini. This Riesling is totally dry with lots of soft floral aromatics and a broad mouthfeel. It's not too lean or acidic, which is typical of Alsace (compared to German or Austrian Riesling). Pictured is my friend Marcel, demonstrating proper tasting etiquette (to be discussed later this week). "Food Miles" are one way to measure the environmental impact of food production. The term refers to the distance a food product travels from point of production to the consumer. A recent study sited in Big Foot, a new book that assesses the carbon foot print of food production, concluded that based on manufacturing, transportation, and energy use wine drinkers East of Columbus, Ohio actually make less of an environmental impact by buying wine from Europe than California. For those of us West of the Mississippi it's more green to buy wine from California. The best choice for reducing our carbon footprint isn't as obvious or simple as buying local. Shipping is a far more efficient and less environmentally impactful means of transportation than trucking. Just something to ponder next time you're at Whole Foods and see all those "buy local" signs. What does "local" mean to a large chain like Whole Foods?